1.2 Habitat. Were to find lavanda plants? 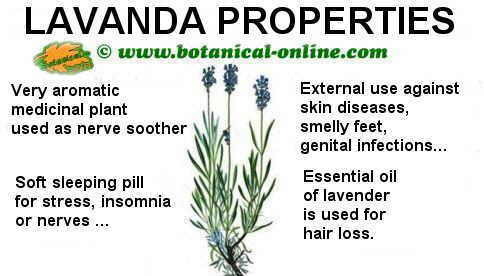 2.1 How is lavender oil obtained? 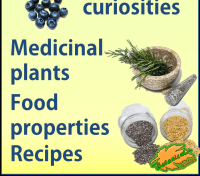 2.2 How to obtain lavender oil at home? General aspect of lavender. It can be found in dry calcareous places either in the wild or as a decorative plant. Scientific name: Lavandula officinalis Chaix, Lavandula spica DC., Lavandula latifolia (L.) Vill., Lavandula side DC., Lavandula angustifolia Miller. “Lavandula” word is derived from the Latin word “lavare” (washing), while the species name “spica” may come from “aspid ” (viper) because Romans thought that this snake slept under the plant. Habitat. 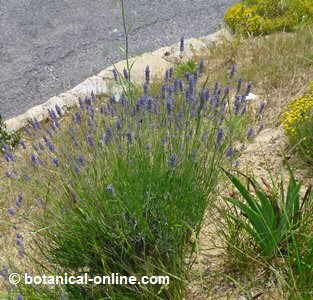 Were to find lavanda plants? Common plant in the Mediterranean basin where it can be found in dry areas of calcareous and sun exposed soils. Very common with other plants such as rosemary. Sometimes it forms hybrids with Portuguese lavender (Lavandula latifolia) called lavandins. 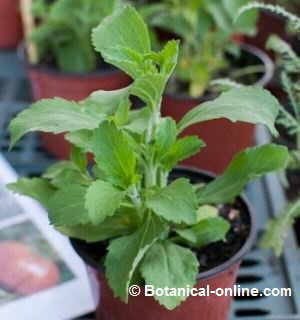 Perennial shrub of the lamiaceae family of up to 1.5 m. high. Woody stems bearing dense gray short pilosity. Linear leaves, wider towards the apex or lanceolate, up to 10 cm in length with the edge usually revolute. The young leaves, hairy, smooth and greenish when adult. Flowers gathered in spikes of violet light at the end of a very elongated flower stems. Spikes from 6 to 10 colored flowers without bracts at the apex, sticky to the touch because of the large amount of essential oil. Purple oval bracts and seven ribs. Flowers smell like camphor, being a stronger smell than in other lavenders. 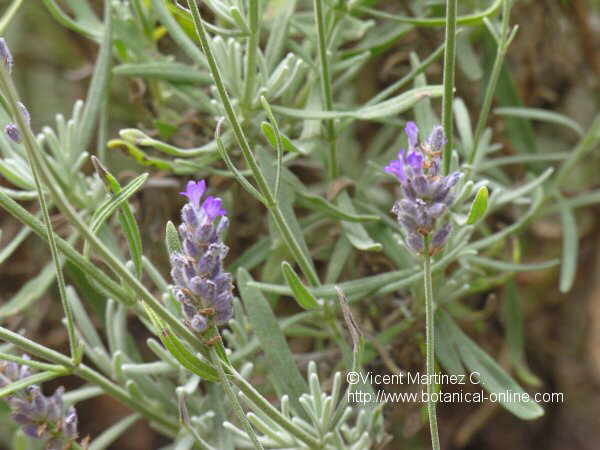 This plant is often hybridized with other species of lavender, especially with Lavander angustifolia. This cross produces much stronger samples and with greater qualities for the extraction of essential oil. Lavender is harvested at flowering, from mid to late July. Flowers collected in the morning contain more essential oil and they are more aromatic. 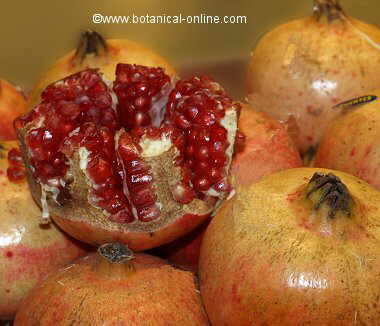 They should be dried in the shade and stored in airtight containers in a dry and dark place. 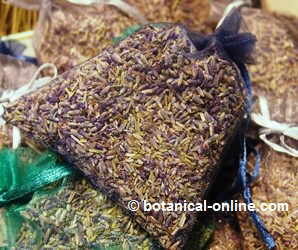 Photograph of a bag of dried lavender flowers. Lavender sachets are used for scenting closed environments, to ward off insects, perfume linen, etc. Since ancient times, lavender has been used as a relaxing herb in the bathrooms. 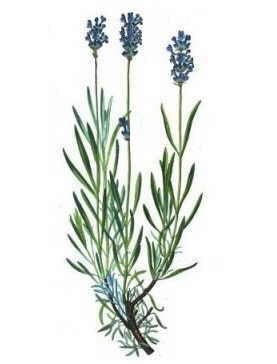 The Romans spread the use of lavender oil in bath water. Whether or not this interpretation is valid, the fact is that lavender has been one of the plants most used in Mediterranean countries, influenced both by the fact that it is a wild plant that grows in great abundance in these countries and the fact that it is very easy to grow. 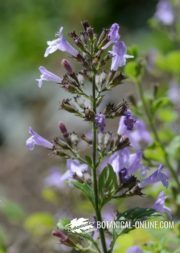 Helping birth: In the past, some women had the habit of grabbing some branches of lavender during childbirth because they thought that this plant will help the baby’s birth. Repelling insects: Cloth bags are manufactured and filled with leaves of this plant to repel flies, mosquitoes or other insects. Scenting clothes or rooms: These bags were placed among clothes to give a good aroma and also keep out moths. These same bags are hung in rooms to provide good smell to them. Facilitating sleeping: Sometimes the leaves of this plant were tucked into bags placed under the pillow because they were thought to help you fall asleep. Killing fleas and other parasites of animals: Lavender oil has been used to remove fleas and other hair parasites from many animals, especially cats and dogs. From a medical point of view, its traditional uses have been very broad. As soothing, as an antiseptic, as a sleep aid, as a digestive, as cicatrizant, etc, its properties have been widely recognized. Although lavender has been used, it is is still being used in preparations for internal use, external preparations, especially those made with the essential oil are the most commonly used today. Lavender oil, rich in esters and alcohols (linalool, borneol, citronellol, geraniol, limonene, alpha-pinene, etc) has anti-inflammatory and sedative properties that make it suitable for the treatment of pain. How is lavender oil obtained? 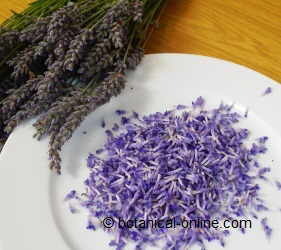 Lavender essential oil is extracted by distilling the flowers. This work is carried out industrially and oils can be easily purchased from pharmacies or herbalists. How to obtain lavender oil at home? Marinating fresh lavender flowers with olive oil and exposing the mixture to the hot sun. Alcoholic extracts if we macerate flowers of this plant with the same proportion of pure alcohol for a week. The principles of lavender can be obtained by infusion of dried flowers at 4% (a tablespoon per cup of water) or using the double amount of tender flowers. This type of preparation is very easy to prepare by the user. 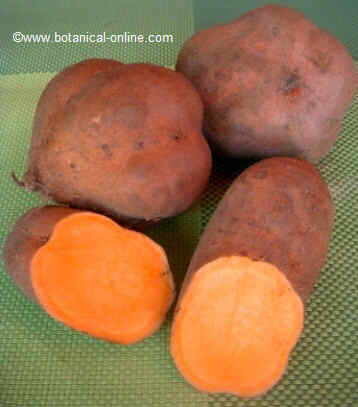 However, it is most comfortable and safer to buy the pre-made prepared in a pharmacy or natural shop. Lumbar pain: In case of lumbago, the same previous treatment can help reduce pain and allow the continuation of normal duties. Rubbing can also be performed with liquid from the infusion of a spoonful of lavender and half a spoon rosemary that has been resting for a couple of hours. Torticollis: When the neck hurts and we can not move it, rubbing made with the liquid from the previous preparation can relieve pain, inflammation of the cervical vertebrae and allow the movement back of the neck. Headache: If you have headache, produced by the stress, manifested as migraine, a massage on the temples with a few drops of essential oil diluted in olive oil will help ease tension and relieve pain. Foot pain: A few drops of lavender oil in a pan of hot water can help to relax the feet and reduce feet fatigue or pain. 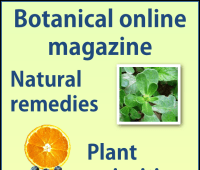 Mainly cineol, linalool, geraniol, limonene, and sabinene confer lavender antiseptic properties that make it highly effective in the treatment of outer skin lesions, as a cicatrizant. At the same time, its richness in tannins provides interesting astringent properties to prevent or cure the skin condition. Cuts: Aid to disinfect the wounds, promotes healing and decreases irritation (Wash the affected area with liquid from the infusion for 10 minutes of a teaspoon of dried flowers per cup of water) This treatment is appropriate in other skin lesions such as scratches, chafings or punctures. Burns: The previous preparation is ideal for the natural treatment of burns. Eczema: Washing eczema with the previous preparation promotes healing. Psoriasis: It improves the manifestations of the psoriasis and alleviates itching. Stings: Washing the stings of wasps, ticks, fleas, mosquitoes, Asian tiger mosquito and other insects with the same preparation helps reduce swelling and decrease itching. Hair loss: Night frictions on the scalp with a few drops of essential oil diluted in olive oil helps to relax the hair follicle and increase blood flow to the area, which can help in the prevention of alopecia. Its antiviral, antibacterial and bacteriostatic properties have been proved to be effective in vitro resulting in the elimination and inhibition of many bacteria and viruses responsible for respiratory diseases. Other bacterial diseases: In the same way, the antibacterial properties of lavender are used to make appropriate washes to eliminate harmful bacteria, such as the fungus Candida albicans, or some other very wellknown bacteria, such as streptococcus, or trichomonas. All of them can be responsible for many vaginal infections. Vaginitis, vaginal flow or candidiasis, that can be remedied with the use of this plant. Lavender flowers (Lavandula sp.) are suitable to help calm nerves. They can also be used to flavor recipes such as cakes, biscuits or gelatins. The antispasmodic and sedative properties of lavender flowers are recognized worldwide. There are countries where lavender infusions or the use of tincture of this plant are prescribed as sedatives and as soft sleeping pills with some frequency. Nervous stomachs: The stomach nervousness is one of the causes of bad digestions in many occasions, intestinal spasms, cramps in the stomach, etc. 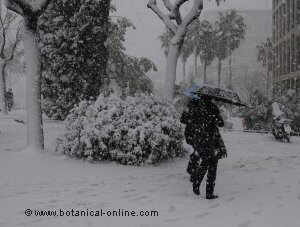 The use of preparations of lavender can help “settle the stomach” eliminating many negative manifestations in this body. Motion sickness: motion sickness while traveling by plane, boat or car is produced in many cases by nerve problems. Anxiety or fear of travel ends up producing this sensation. The above remedy can be used to reduce or prevent motion sickness while traveling in a moving means of transport. (Infusion for 10 minutes of a teaspoon of dried flowers per cup of water. Take 1 cup water 1 hour before the trip) The same preparation is suitable for the treatment of vertigo that has a nervous origin. Besides treating stomach nevousness, it has also been proved its choleretic properties (it stimulates the production of bile by the liver) and cholagogue properties (it simulates the production of bile by the gall bladder), making it suitable for heavy digestion due to lack of drainage. Lavender has some contraindications, toxicity and side efffects that are very important to know before taking it.